​​ CORPUS CHRISTI – A massive crude carrier called the Anne docked at the Port of Corpus Christi without a drop of oil in its cargo hold. Anne is the largest oil tanker ever to call on a Gulf of Mexico Port. The ship docked safely at the Oxy Ingleside Energy Center (OIEC) export terminal, the first crude oil export facility in the U.S. to receive such a large vessel, the company said in its press release. Occidental Petroleum Corporation is using the visit for operational planning in preparation to regularly load VLCCs in the future from its oil export terminal. The VLCC, owned by the Belgium-based Euronav, is a 1,093-foot-long vessel capable of holding over 2 million barrels of oil. 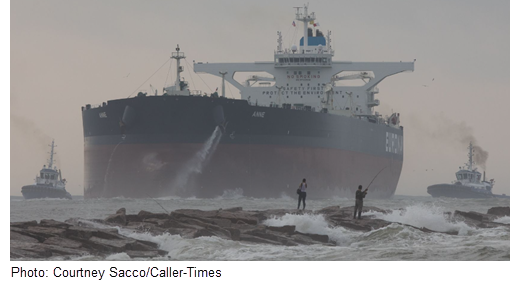 Ship channel depth at Port Corpus Christi is at -47’ Mean Lower Low Water (MLLW), which would require a partial load of the VLCC, and an accompanying vessel to fill the remaining cargo once offshore. Port Corpus Christi is in the midst of a ten-year, $1 billion Capital Investment program. A major component of the program includes the Corpus Christi Ship Channel deepening and widening project.